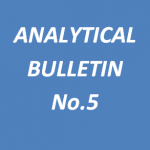 The Institute of Contemporary Development has published its fifth analytical bulletin in 2012. The main themes of the issue are Russia’s upcoming presidency of the G20, financial risks of the global economy and the G20 agenda, Chinese investment in the EU, and extra-regional players in the Arctic. Below are summaries of the articles and the full bulletin in Russian can be found here.